For the second time in three years, the Terriers will face Minnesota Duluth in the NCAA Regional with a trip to the Frozen Four in Chicago on the line. The Western Regional final in Fargo begins at 6 p.m. ET and will air on ESPNU. Last night, #6 BU defeated North Dakota, 4-3 in 2OT on a Charlie McAvoy goal, while the Bulldogs also went to extra time, defeating Ohio State, 3-2, on Willie Raskob’s goal at 11:58 of overtime. Both goalies faced a ton of rubber with BU’s Jake Oettinger making 56 saves while UMD’s Hunter Miska turning aside 40 shots. 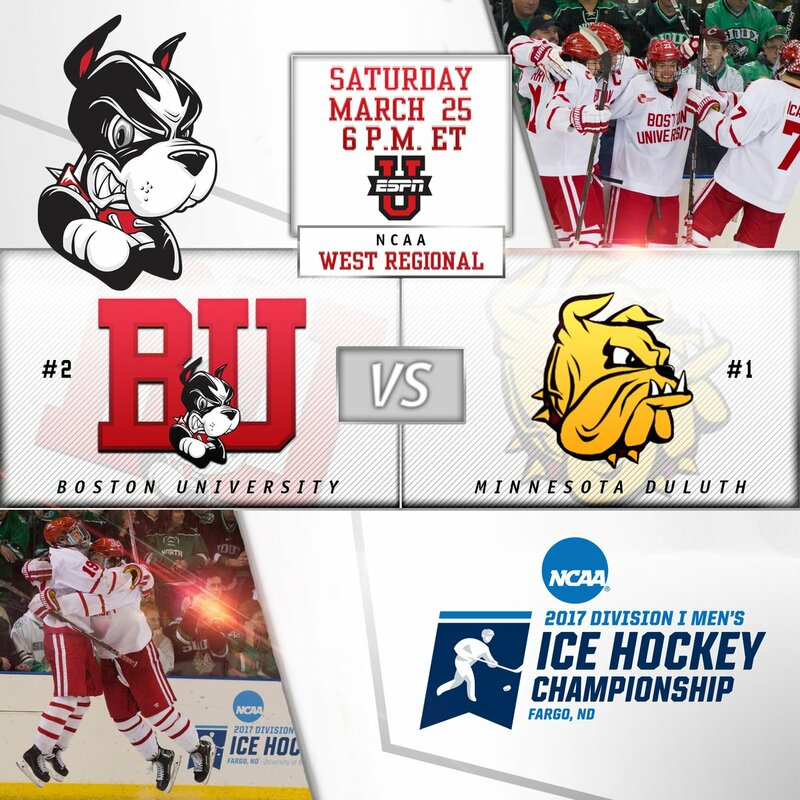 In the 2015 regional in Manchester, N.H., BU edged Duluth, 3-2, when Evan Rodrigues broke a 2-2 tie with a slick toe-drag goal in the final minutes of the third period. ●Click here for game day links. ●The Boston Hockey Blog will again have an in-game live blog. NTDP Evaluation camp for next season’s U17s began Friday with six future Terriers on the camp roster: forwards Robert Mastrosimone and Trevor Zegras and defensemen Braden Doyle, Case McCarthy, Alex Vlasic and Cade Webber. Nick Bonino scored his 16th goal—and his seventh in the last 10 games—in Pittsburgh’s 2-1 shootout loss to Ottawa.